This summer has been a bumper season for bizarre Double-crested Cormorant shots — from one being rescued after getting its neck wedged in an old tide gate to one getting into a wrestling match with an eel. 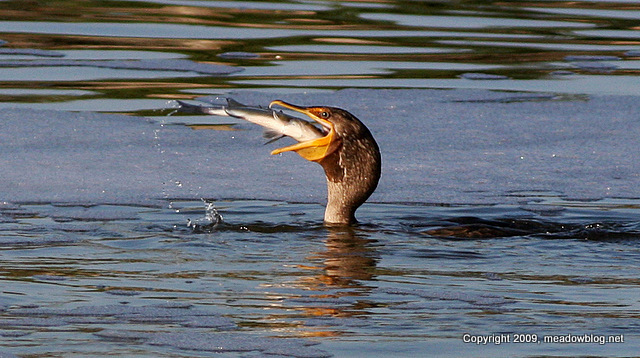 This time around, we thought we'd show a sequence of what D.C. Cormorants do best — eat fish. The sequence was photographed last week at DeKorte Park out by the Saw Mill Creek Trail. Click "Continue reading…" to see the sequence. NJMC naturalist Mike Newhouse demonstrated bird-banding at Harrier Meadow at last year's Meadowlands Festival of Birding. He will reprise the demonstration on Sept. 12 and Sept. 22 at Harrier. We have a full slate of events over the next two months, including several walks and the big Bird Fest on Sept. 12 and 13. Click "Continue reading…" for the whole lineup. 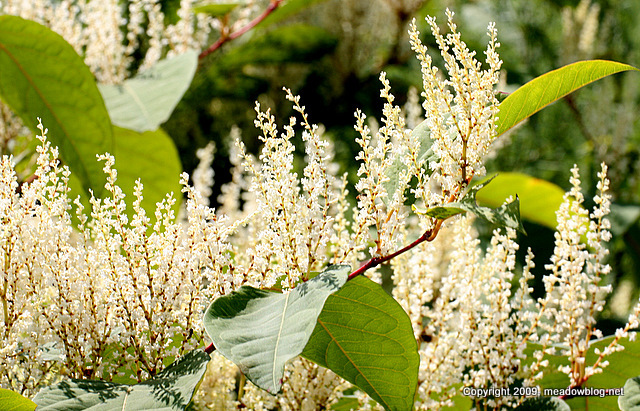 This is Japanese Knotweed, an invasive plant, on a Meadowlands landfill. 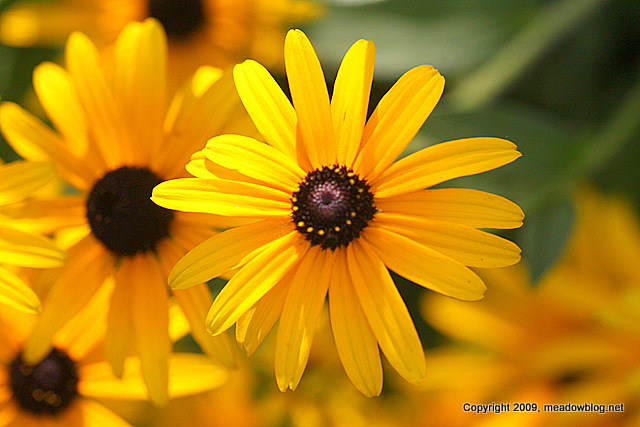 As the old fortune cookie saying goes, "Even dirt glitters when the Sun is shining." This was a good day for raptor sightings, including a Peregrine Falcon on the Route 3 Bridge (see next week's Tuesday Teaser). 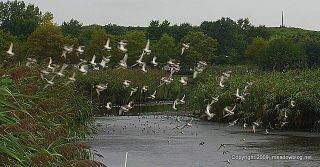 We also saw a Northern Harrier over the Saw Mill Creek Wildlife Management Area and eight Ospreys flying over the Richard P. Kane Natural Area by the Hackensack River in Carlstadt. The day was topped off by this Red-tailed Hawk, on a Sycamore branch by the far parking lot at DeKorte Park. We figure he was keeping an eye out for an unsuspecting squirrel. Last week, we posted an item about a hard-to-ID dove we saw on a Harrier Meadow walk (photo above). Link is here. Many readers voted for the Ringed Turtle-Dove, but it just may be a semi-domestic strain now called "African Collared Dove." Click "Continue reading…" for the full explanation. Now that the DeKorte Shorebird Pool water levels have been lowered, we're getting lots of birds fishing and mud-rummaging in there. 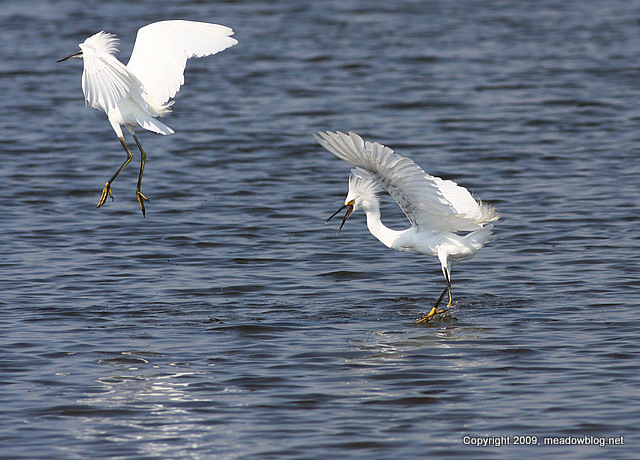 Yesterday, we saw these two Snowy Egrets with Mohawk-hairdos have a little spat over fishing grounds — just like nations like to do. One of the tricks of finding shorebirds at DeKorte is timing the mudflats. Unfortunately, it's a bit of an art and a science. In this post, we'll try to suggest some ways of increasing your odds of getting a good shorebird day. To find out roughly when the low tide at DeKorte is going to be, calculate the low tide at the Amtrak Swing Bridge on the Hackensack River, and add two hours. 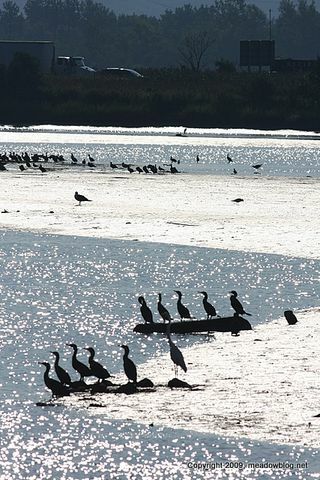 Click "Continue reading…" for links to the tide charts and another mudflat shot. Thanks again to everyone who took a flier on the weather and attended "A Day With Kevin Karlson" on Saturday. 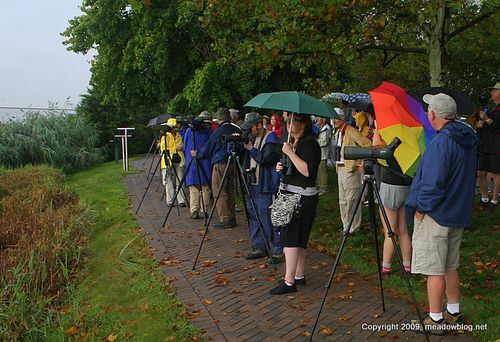 We had a spot or two of rain during the morning walk, but we did have enough mudflats in the Shorebird Pool to get a lot of peeps and several other good birds. Thanks again to Kevin Karlson, ably assisted by NJMC Naturalist Michael Newhouse, NYC "Mega-birder" Lloyd Spitalnik and Ace North Jersey birder Rob Fanning. Click "Continue reading…" for the Full Monte. This is another find from the butterfly walk on Sunday, Aug. 9. 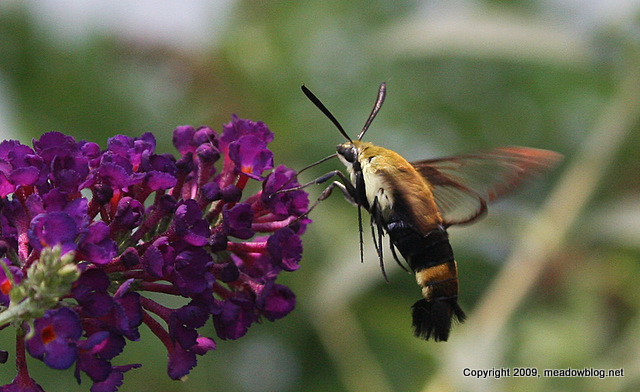 We assumed that it was Hummingbird Clearwing Moth, and we assumed wrong. Thanks to walk leader Tom Halliwell for the right ID.